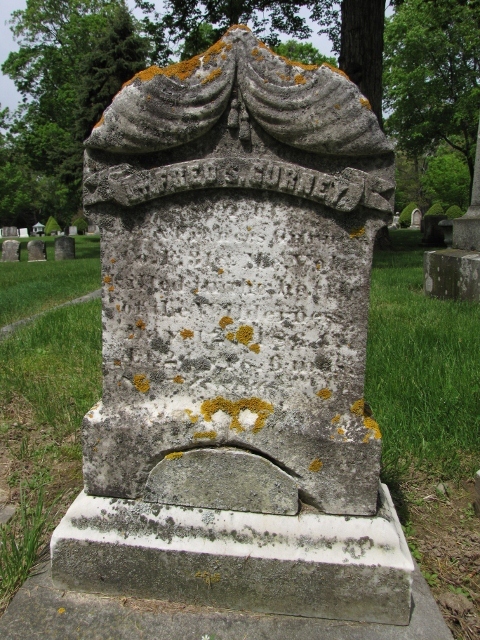 FREDERICK "FRED" S GURNEY, the son of Seth and Frances A (Neal) Gurney, was born in Saco, Maine ca Dec 1839 (based on age at death). He was killed in action during the Battle of the Wilderness, in Spotsylvania, Virginia, on 12 May 1864, aged 24 yrs, 6 mos. He is buried in Laurel Hill Cemetery, Saco. Fred first enlisted shortly after the war broke out, on 24 Apr 1861, and was mustered in as a lieut. in Co C, 5th Maine Infantry. He resigned this post and was discharged on 14 Aug 1861. His second service was with the 27th Maine, from 10 Sept 1862 to 17 July 1863, where he was a sergeant. In the spring of 1864, two more regiments of infantry were needed from Maine, and Fred Gurney worked as a recruiting officer for the town of Saco. On mustering in in April 1864, he became the 1st Lieut of Co F, 32nd Maine. The regiment was quickly shipped off to the war front and during the Battle of the Wilderness (or Spotsylvania Court House), on 12 May 1864, Lt Gurney "was struck down upon the field during the fiercest fighting and died without a struggle" [History of the 32nd ME, pg 141]. His and his company were lying on the ground, under heavy enemy fire, when he was struck in the forehead and died nearly instantly. Pg 321 of the History states his body remained on the battlefield until the following day, when it was then buried where he had died. He may have been disinterred and returned home to Saco. An 1864 listing of Maine men buried in two cemeteries near the battlefield do not list him. In 1869, the Saco veterans of the Civil War organized a GAR post there, naming it the "Fred S Gurney Post, No 5", in honor of their fallen townsman. The Post was reorganized years later, and would be renumbered #36.